The students MOXA Team for the REXUS 15/16 rocket project at the University of Technology Dresden launched in May 2014. Our goal was the measurement of ozone and oxygen in the lower atmosphere. 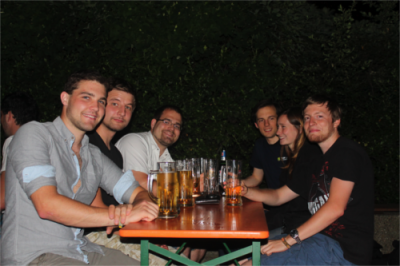 After a long discussion about all things that are to do the next four weeks and technical detail discussion we enjoy a beer at the “Bierstube” in Dresden. We have sucessfully performed our Preliminary Design Review and had a great training week at the DLR facility in Oberpfaffenhofen! There we had the three represants of our team, Alexander Mager (Teamleader), Patrick Geigengack (Mechanical) and Alexander Schultze (Electronics & Software) presented the current design to experts from ESA, DLR and ESRANGEchecked our design in detail, gave us very useful advise and a showed us things we can improve. A highlight was the final event – which ended up to be the 5.th Anniversary of the Columbus Module Launch, giving us a wonderful opportunity to listen and talk to people like the Prof. Wittmann, the former Director of Space Operations and Astronaut or the Operation Manager T. Kuch from the German Space Operation Center (GSOC), and two actual ESA astronauts, Leópold Eyharts and Pedro Duque. You may remember that Leopold Eyharts was the one who attached the Columbus Module to the ISS in 2008 during the STS-122 mission. But – he also was the one who attached the EuTEF experiment module to the space station, which first flew our FIPEX-sensors to space to measure atomic oxygen in a high temporal resolution for the very first time! 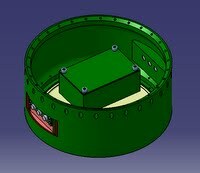 As today, the Preliminary Definition (PD) of the experiment has been finished. Many major decisions have been made, like the position of the sensors, the latch and the development of the electronic circuitry. 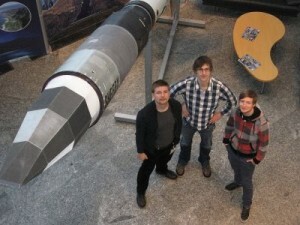 This design will now be evaluated in Oberpfaffenhofen at the German Aerospace Centre (DLR) by experts in the next week! Initial design idea for experiment. Welcome to the MOXA Teampage!